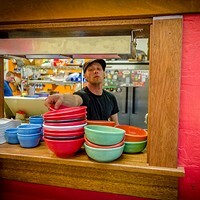 photo by Jennifer Fumiko Cahill A breakfast club worth joining at Big Blue Café. 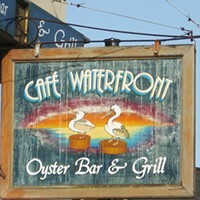 photo by Jennifer Fumiko Cahill Free your mind with chicken fried pork at Café Waterfront. photo by Jennifer Fumiko Cahill Nooner Too's biscuits and andouille sausage gravy, cher. It's hard to order before you've had your coffee. Here's what's getting us out of bed this month. A few weeks ago, iconic pop star and holder of Champagne flutes Mariah Carey declared brunch over. On some level, she may be right. We may be done waiting in line (Mimi would never) to pay through the nose for swanky, Instagram-ready cloud eggs. But old-fashioned brunch — the big breakfast that forgives your rolling out of bed just shy of noon and gives you a pass to day drink and possibly return to said bed — will never be over. I offer you Big Blue Café's (846 G St., Arcata) hefty, unglamorous Breakfast Club sandwich as evidence ($10.99). 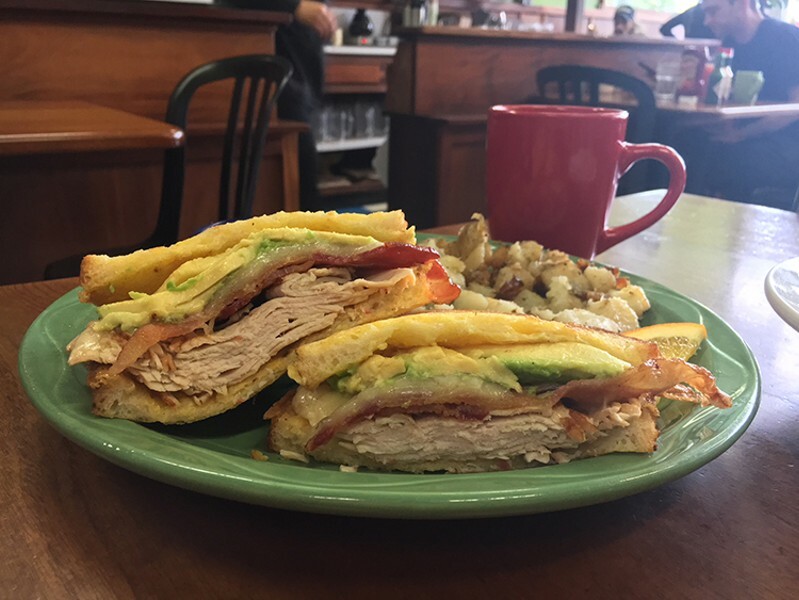 Like a heartier and more Californian Monte Cristo, it's built on French toast and stuffed with turkey, thin bacon, sliced avocado and pepper jack. The bread is firm and chewy enough to support the volume, especially if you're up for blurring the line between sweet and savory with the accompanying syrup. Your server will alert you that real maple syrup is available for $1.49 and if you can't see why that's utterly worth it, then you have chosen your path and I will not try to win you over. (Taps fingers and stares out window.) Yes, I will. It's a pittance when you're already out for a meal and the earthy, floral taste is beautiful and worlds better than the slick, artificial stuff. When the syrup runs into your home fries — which are best ordered extra crispy — and you are flooded with happy pre-Instagram diner memories, you'll know you made the right choice. Then you can go right back to bed, content. In the interest of transparency, I would like to confess that I have been closed-minded about biscuits and gravy. 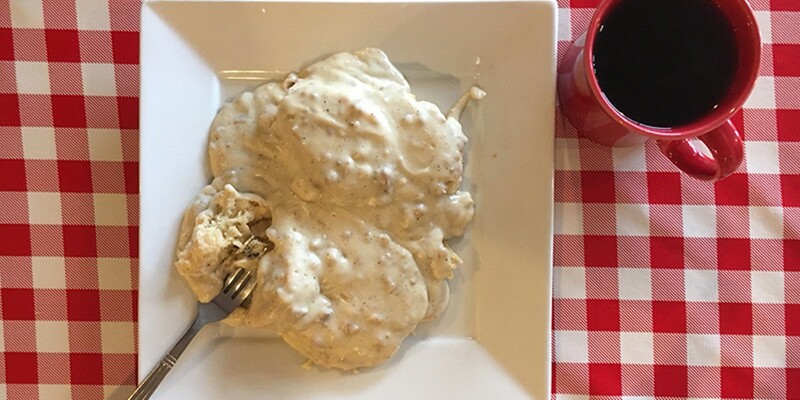 Haunted by a decades-ago plate at a truck stop near the Texas-Arkansas border with payphones in the dining booths, it was hard to accept any variation on the standard dusty-topped, fluffy biscuit all but drowned in peppery, white pork sausage gravy. Only recently have I opened my heart and its attending arteries to anything else. 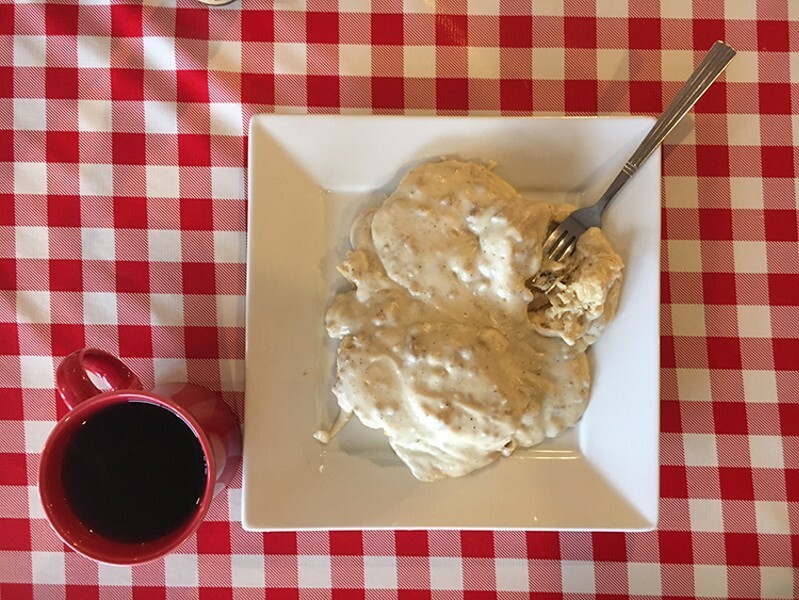 A fellow Journal staffer recommended the Cajun biscuits and gravy ($8.25) at Henderson Center's Cafe Nooner Too (2910 E St., Eureka) but I hesitated because it's made with andouille sausage. 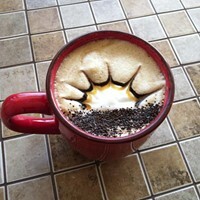 On a recent rainy morning, leaning into the steam from a full order, I got over it. The garlic and wine flavors from the andouille sausage make for a hammier, more aromatic pan gravy that's homey and satisfying. Dig under the smothering blanket and your fork will hit a pair of split rolled biscuits that pull apart in dense layers. The Nooner kitchen wisely avoids trying to make it pretty — this is comfort food, after all, a hot plate to finally warm your bones on a rainy morning, not a beauty contest. Best to keep it simple. 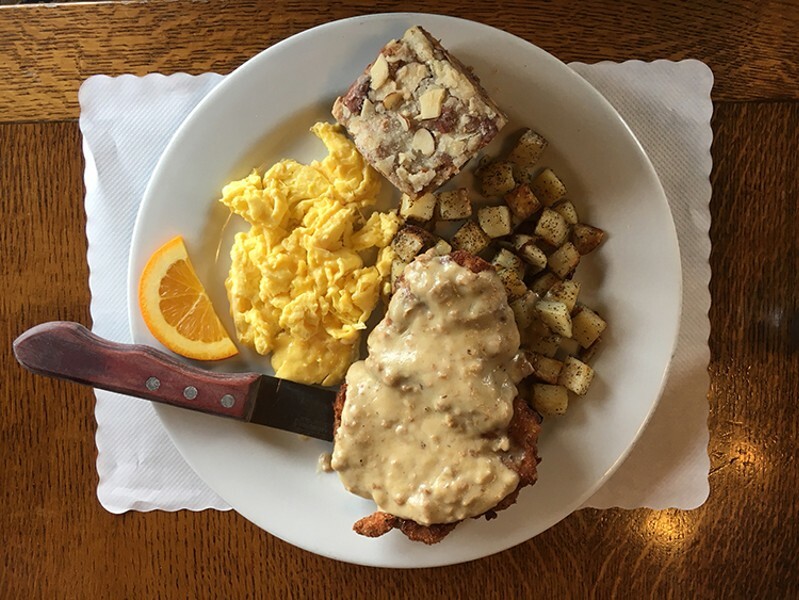 Well, at least until Café Waterfront (102 F St., Eureka) stops serving breakfast around 11 a.m. We got a tip chicken fried pork chop was on the specials board ($13.95) and followed it up, though to be honest it could have been chicken fried hammers and we'd still have tried it once. The dinner-sized cut of pork is crusted with seasoned bread crumbs, rather than a traditional flour coating, making it closer to a schnitzel, but it's glorious and we're not hung up on labels anymore, remember? The meat itself is tender and juicy enough to serve without the accompanying cascade of caramel-tinted pan gravy, which is rich and picks up the flavor of the Parmesan in the breadcrumbs. It's flanked by a couple of lovely eggs and herbed potatoes. Before you choose your toast, consider the cinnamon and almond coffee cake, a warm square of which is a breakfast/brunch game changer. Does it count as dessert? Tsk. Labels. Share your hot tips on food around the county with Jennifer Fumiko Cahill, arts and features editor at the Journal. Reach her at 442-1400, extension 320, or Jennifer@northcoastjournal.com. Follow her on Twitter @JFumikoCahill.